Have you often thought to yourself, “I can do a better job running this company than my boss?” Do you fantasize about setting your own hours, and working by your own rules? As more and more employees continue to be disengaged at work, one possible career path, which is not often explored, is that of being an entrepreneur. 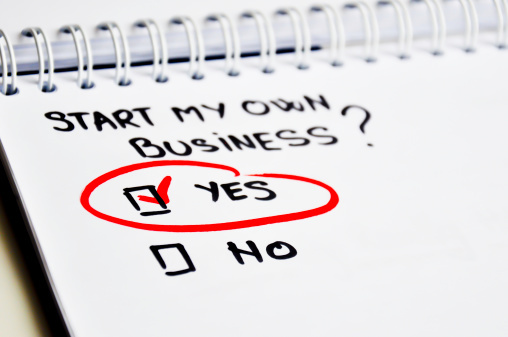 Many people think that they would love to be their own boss, and to run their own company. 1) Responsibility- as your own boss, you will be accountable for all aspects of your business. Whether it is payroll, finance, operations, human resources, you are expected to handle all these aspects for your business. While you can certainly outsource some of these functions, ultimately the buck stops with you. If you hire employees or take on investors, you will also be accountable to them. If you feel a bit queasy about having such a high degree of responsibility, you may wish to consider deeply & honestly if being an entrepreneur is an ideal option for you. 2) Work-Life Balance– while being your own boss can be attractive, most entrepreneurs will tell you that you will work more hours for yourself, than for someone else. Many have the fantasy that they can go to “work” at noon, clock a couple of hours, and then relax. That is rarely the case. If you like a consistent 40 hour workweek, this path may not be suitable. When you are an entrepreneur, it may be difficult to be “off the clock,” and you can find yourself working 12-15 hour days, including weekends. While maintaining work-life balance is still a critical aspect of entrepreneurial success, it definitely is a challenge to turn off your business brain when you are in charge. 3) Risk Tolerance– according to the Bureau of Labor Statistics, 50% of businesses fail within five years. Therefore, becoming an entrepreneur is a risky proposition. It is important to be honest about your risk tolerance. If you are risk-averse, entrepreneurship may not be a fit for you. Many variables outside of your control can impact your success. Market conditions, rapid technological advances, and changing consumer tastes can leave you at a disadvantage. For every Google, there are more MySpaces, Netscapes, and Kozmo.coms. Risk is a big part of the entrepreneurial equation, and something to be considered strongly when assessing this path. 4) Level of Comfort with Uncertainty– in addition to risk, life as an entrepreneur is filled with uncertainty. Will that customer follow through with that large order? Will I get the line of credit that I need? Can I secure the patent, which can give me a competitive advantage? How will we make payroll this month? If you are uncomfortable with uncertainty, being an entrepreneur may be too much of a stretch. 5) Confidence- to be a successful entrepreneur, you must be confident in your vision, in your product or service, and in your ability to deliver quality results. Confidence does not mean that you don’t seek consultation, since it is important to listen to the advice of others. It also doesn’t mean that you stubbornly and blindly move forward with an idea or product which isn’t marketable. Confidence means that you will not treat every setback or hurdle as a major catastrophe. Confidence means that you know that you will put in the necessary work to make the business successful. If confidence is a struggle for you, it doesn’t necessarily close the door to entrepreneurship for you. Rather it means that you must work on building confidence, through coaching and performance accomplishments. 6) Humility- the image of the hard charging, ultra-confident Steve Jobs strikes many as the ultimate example of what an entrepreneur should be. However, the fact is that most entrepreneurs who succeed are humble enough to seek help. They are secure enough to know what they don’t know, and to find experts in supporting them. You must be open to feedback about your business, and to be able to critically assess opposing viewpoints, for the benefit of your company. Being sensitive to criticism does not preclude you from owning a business but it is something that should be addressed. 7) Stress Management- as mentioned above, part of being confident is to not let every barrier severely distress you. Managing stress is another critical aspect of being an entrepreneur. An aspect of entrepreneurship which is beginning to be discussed, but is still under-examined, is the mental and emotional toll it takes on business owners. Recent reports of founders committing suicide or burning out, demonstrates the harsh reality of being an entrepreneur. Pressure from investors to launch a product, false notions that working 18 hour days is heroic & a testament to your drive, and the isolation which comes naturally with being the boss, can push entrepreneurs to not adequately address their mental health and stress management strategies. Therefore, a stress management plan should be integrated into your overall strategy. Meditation, mindfulness, adequate sleep, setting realistic expectations and boundary management between work & leisure are some ways to reduce stress for entrepreneurs. 8) Leadership Skills– some people like to be in charge of themselves, but not of others. Growth in business requires strong leadership skills, including vision, ability to motivate others, conflict management, strategic planning, and focus on execution. Here is another area where effective coaching can help you bolster your leadership skills and your willingness to manage. For many, entrepreneurship is the key to a happy and enriching work life. If you are exploring this option, considering the above factors will be beneficial to determining if it is a viable path for your success and satisfaction.